THERE’S always an element of curiosity and excitement that defines most of Shobha De’s writings. Whether it is books, articles or even TV scripts, she manages to give the story a definitive direction and character. Had Kitty Party on Zee TV, every Wednesday at 8 p.m., been penned by a lesser writer, it would have surely been another one of Zee’s line of flops. But in De’s hand, the same subject becomes deliciously malicious and gossipy. The serial explores the lives of a set of well-heeled women — their hopes, aspirations and longings. Each character is reflected through her interaction with others. It is more than a mere tittle-tattle club. Here close bondings take place. But this kitty party also has its share of hurt and jealousy that often follow these fancy lunches. It is a clever insight into the mind of today’s urban Indian woman who is poised at the crossroads of modernity and tradition — and when these two worlds clash Shobha De is at her vitriolic best. Zee may finally have a winner on hand. They are on the go, go..and go. Arguable the country’s first professional all-girl band, Viva! has been rocking the cities ever since it hit the high road to Indipop stardom. Band members — Mahua Kamat, Seema Ramchandani, Anushka Manchanda, Pratichee Mohapatra and Neha Bhasin — are a transformed lot. New hairstyles, newer wardrobes, trendy dance steps and an attitude to match. The hot and happening girls of television. And now they have another new to their credit — a new VCD. Now you can watch the five girls go through the rigorous grind — hectic physical training, voice modulation, training in music, grooming. There’s also their excitement, ecstasy and emotions. For Rs 799, you can see how the five girls with fire in their belly and song on their lips made it to a band that has transformed simple Cindrellas to celebrities. Star Plus seems to be riding the crest of good fortune. Even as afternoon slots of Zee and Sony are registering low viewership, the channel is bounding ahead with shows aimed specially at women. The latest in the series in Chhupe Chehre, every Friday at 3 p.m. hosted by Shireen, who left Star Plus sometime ago only to re-appear. In her earlier stint, she was anchoring the Breakfast Show, but with that slot gone, she’s now on to a new programme where she plays agony aunt. Here she helps ordinary people come forward and talk about their fears, problems, intuitions and concerns. The concept may be as old as the hills but it seems to be clicking. "Once a person opens up he or she not just shares problems just with me but with so many people who’ve gone through similar experiences and can render valuable advice," says Shireen. This may not be Oprah Winfrey stuff but the show does have the potential to hold your attention. Much like cricket, it’s a big hit with viewers. And even as the cricket season gets under way, sports lovers will be glued to ESPN Start Sports’ Super Selector to find out who’s winning and who’s losing in the cricket game show. The first on-air game show will take place on September 19 as Super Selector comes up with a new format and is all set to become India’s first live game show. An innovative interactive element has been added to the show where randomly selected participants will be telephoned live and will he quizzed about their knowledge of cricket. Correct answers can win big prizes such as a car or a motorbike. The winner mechanism has been extended to accommodate more cricket enthusiasts. Apart from the online entry, participants can enter by a competition post card or a fax. The weekly live show will be hosted by Darain Shahidi and Poonam Sharma and will be joined in by celebrities like Geoffery Boycott, Navjot Singh Sidhu, Naseeruddin Shah and Harsha Bhogle. So pull out your cricket gear for a long innings at this interactive game show. Forget the battle for the air waves as far as serials go. 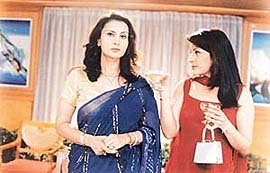 Forget the Saas-bahu fracas across the channels. There’s a new war out there which is having far serious ramifications. News in the new focus area where a number of channels are expending their energies and money. If Prannoy Roy is breaking free with his own channel, there are others who are honing up their resources to give him competition. DD Metro for one is going after the news pie. The slot vacated by Aaj Tak two years ago has been grabbed by a Delhi based production house, BAG Films. Rozana daily at 10.30 p.m. promises to beam in 24 minutes what happened in the world in the last 24 hours. 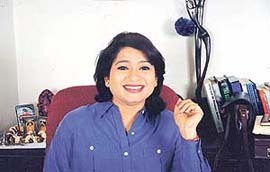 BAG Films chief Anuradha Prasad is very upbeat about the project. "There are over 18 crore TV homes for whom DD is the only window to the world. This is a big challenge." Rozanain Hindi will have 12 platforms, ranging from news headlines and analysis to investigative reporting and public concerns. And with millions of homes as prospective viewers the production house is rubbing its hands in glee thinking of the ad potential. It’s an all-new adventure series on the Lonely Plannet. Globetrekker, starting September 16 at 5 p.m. on the Discovery Channel, brings the very best in adventure travel into the homes of viewers. Each episode visits a new locale around the world, providing the freshest stories and adventures for the serious traveller and also the armchair voyager. The channel heads off to South Korea in the premiere episode. Start your journey in Seoul where you can buy some ginseng in the market, get a lesson in taekwondo, visit the largest church congregation in the world and have a wild night in the town. From there go on a tour of the DMZ (demilitarised zone) bordering North Korea and then head off into some gorgeous scenery for some Zen mountain biking. Spend some time in ancient Hahoe village, before visiting the stunning temple site of Geong-Ju. Your next stop is the bustling port city of Busan where you can visit one of Asia’s largest fish markets before taking the ferry to the honeymoon island of Jeju-do. Finally witness the scantily clad free diving women of Jeju-do — a befitting end to your South Korea sojourn.